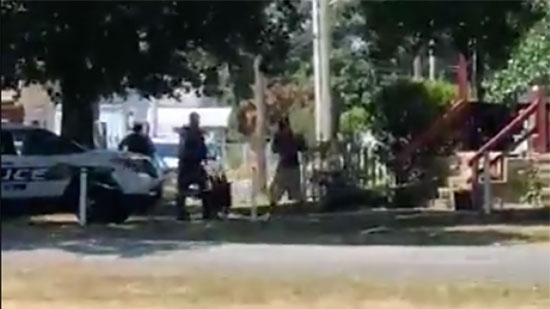 The Cumberland County Prosecutor's Office is investigating after police shot and killed a man in Vineland, NJ, on Saturday, 7/14. Police were called to a residence on W. Wood Street, between Boulevard and 4th Streets, around 11:30 a.m. for a man acting suspiciously. The interaction between police and the man was caught on video by a passerby. After several minutes of yelling back and forth and the man pacing the front yard, officers opened fire and killed the man. It is not clear from the video what was being said. He has not been identified at this time. If you have any information contact Detective Joseph Lowry of the Cumberland County Prosecutor's Office at (856) 453-0486, extension 11197. See link to video below. Philadelphia Police have arrested the stepfather of a 6-year-old boy who died on Thursday night, 7/12, in their Southwest Philadelphia home after hitting his head on the floor. 39-year-old Michael Williams has been charged with murder and endangering the welfare of a child. It happened around 7:30 p.m. on the 2100 block of South Daggett Street. Travon Register was outside playing with water and when he came inside he slipped on the kitchen floor hitting his head. The boy was put in a bed. Almost two hours later, Williams went to check on him and found him unresponsive. He called police, but it was too late, Travon was pronounced dead at the scene. The boy's mother was at work at the time. Williams had been taken into custody on Friday night, 7/13. The owner of a horse sanctuary in Camden County is being charged with over 60 counts of animal cruelty and animal neglect. 62-year-old Sarah Rabinowitz is the owner of Labrador Hill Equine Sanctuary in Waterford Township which houses approximately 70 animals. Authorities executed a search warrant on the property on Friday, 7/13, to document the conditions of the property and the health and welfare of the animals. Rabinowitz was given an immediate court order to fix the insufficient water sources and inadequate sheltering for the animals. She was released pending a future court date.